Performers include: Stephanie Zimbalist, Pierce Brosnan, Doris Roberts, James Read, Janet DeMay, and Jack Scalia. Laura Holt (Stephanie Zimbalist) is a talented private detective. The only trouble is that potential clients won’t hire her because she doesn’t fit the typical stereotype and isn’t a man. To overcome this problem, she decides to invent a male boss for herself named Remington Steele — basing the name on her Remington typewriter and the Pittsburgh Steelers football team. Laura names her agency after him and business immediately picks up. Soon after, a thief (Pierce Brosnan) overhears someone calling for “Remington Steele” and, in order to escape from some thugs, assumes the identity. He soon decides to make the alias permanent and Laura goes along with it because she realizes the value in having someone physically play her boss. Murphy Michaels (James Read) is Laura’s partner in early episodes and pines after her. He eventually leaves to start his own agency in Denver, leaving the door open for another romance. The agency’s first secretary is Bernice Fox (Janet DeMay). She resigns after marrying a musician and is replaced by former IRS agent Mildred Krebs (Doris Roberts). As the series progresses, Mildred becomes an active member of the detective team. A “will-they/won’t they” romance develops between Laura and her “boss” but she never learns his real name or much about his background. In the show’s final “season,” adventurous Tony Roselli (Jack Scalia) competes for Laura’s affections. The group is visiting the Irish castle that Steele’s inherited. Tony is accused of being double agent so they hide him there. Daniel Chalmers (Efrem Zimbalist Jr.) must turn him over to the KGB as part of a scam he is running to help the daughter of an old friend. Daniel dies after revealing he’s Steele’s father and the newlyweds finally get to consummate their marriage. First aired: February 17, 1987. There haven’t been any remakes or revivals of the series. The series was cancelled at the end of season four, on May 15, 1986, with a 60-day option left on the show. That same day, Brosnan agreed to play the role of James Bond in multiple movies for many millions of dollars. 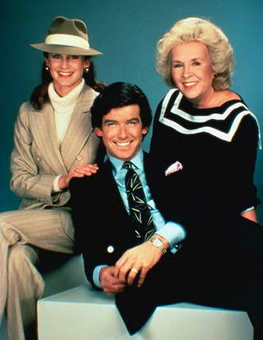 That generated so much publicity that ratings for Steele soared during the summer months and NBC decided to bring the series back for an abbreviated fifth season of three two-hour movies. With a seven year contract, Brosnan was obligated to do it. NBC was willing to cooperate with the Bond producers to share Brosnan’s time but producer Albert Broccoli didn’t feel audiences would pay money at the theaters to see essentially the same character they could see at home for free. Brosnan was replaced by Timothy Dalton in the James Bond movies. He eventually got to play 007 almost 10 years later when he replaced Dalton for 1995’s GoldenEye. Zimbalist had also supposedly been cast as Officer Anne Lewis in RoboCop but had to pull out of that movie. That role went to Nancy Allen.